The Thirukkural meaning ‘Sacred Verses’ is a classic Tamil Sangam literature authored by Sage Thiruvalluvar and remains one of the most widely translated works in the world. He diagnoses the intricacies of human nature with such an acute insight, great mastery and consummate skill absorbing the most subtle concepts of modern psychology, that one is left wondering at his sweep and depth. 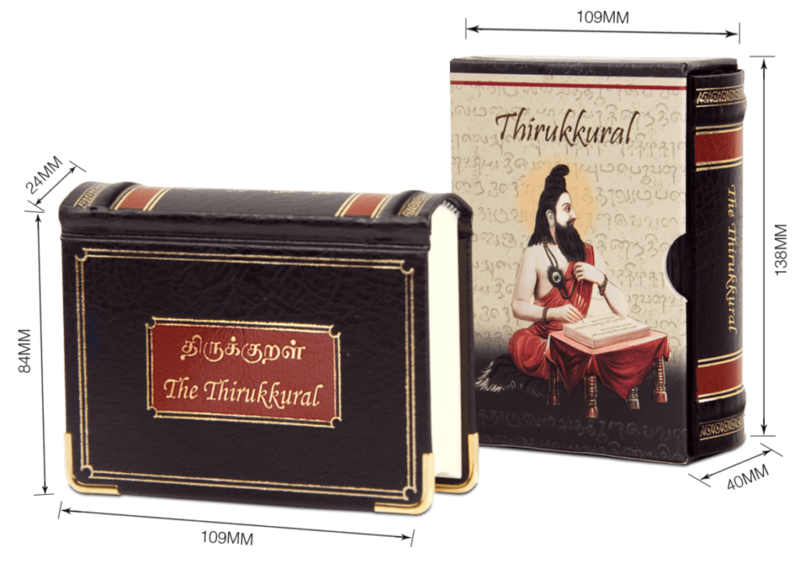 The library edition of the Thirukkural comes with a cassette cover styled rigid box showcasing a beautifully printed illustration of Sage Thiruvalluvar. This edition of the sacred verses is made with a special high quality cloth based cover material with artistic foiling and has been embellished with gold plated corner clips. The book contains 1330 couplets presented in Tamil verses and their respective explanations, in Tamil as well as in English. 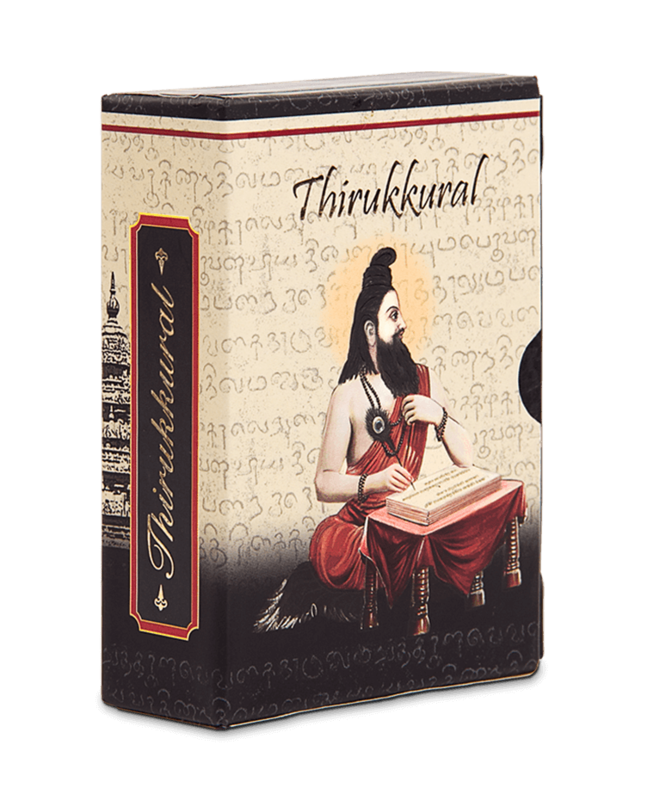 The Thirukkural is considered as the greatest book on ethics and morality, as it emphasises Aram (virtue), Porul (wealth) and Inbam (love) and therefore the ultimate book which guides mankind to live in moral purity, spiritual knowledge and prosperity. 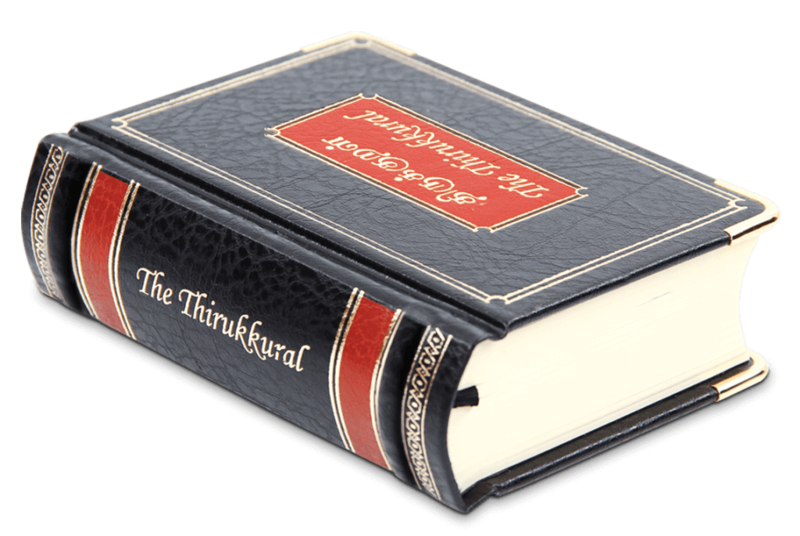 I must congratulate you on your wonderful book “The Thirukkural”, with the kural, the meaning in Tamil and the Translation in English. The compact size makes it a valuable travel companion. Excellent quality book that will last for a long time. Pages are thin like Bible paper so care must be taken when reading. Beautifully laid out and amazing artwork on the front.